A comic workplace classic about the perils of standardized communication. Company President Mr. Gross receives a memorandum but can’t read it because it’s written in Ptydepe*, the newly invented language to which all correspondence must adhere. If he can’t figure out what it says, he’ll lose his job and certainly his mind. This satirical take on bureaucracy and office malarkey is an incisive look at 20th century Communist Czechoslovakia, but it could just as easily be today’s America. This performance is approximately 2 hours and 15 minutes, including a 15 minute intermission. A discussion about the intersection between politics and performance in Václav Havel’s life and work, as well as the implications of producing The Memo in the United States today. Featuring Dr. James Ball. A panel discussion about the origins, history, and contemporary reality of living and working within bureaucratic systems. Featuring organizational psychologist Abby L. Mello, Ph.D. and Federal Transit Administration Director of Communications Amy Bernstein. From Velvet Underground to Velvet Revolution and Beyond: Václav Havel, Czechoslovakia, and the United States. 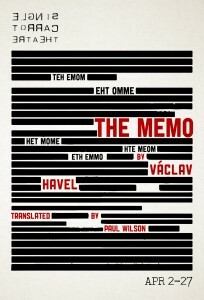 5:30pm – Panel discussion with experts on the context surrounding Václav Havel’s The Memo. Panelists: Dr. Lily Gardner Feldman, Dr. Jana Koplentova Rehak , and Frank Rehak. *What is Ptydepe? More info HERE.